U.S. Secretary of Agriculture Sonny Perdue addresses U.S. sorghum farmers who represented National Sorghum Producers in Washington, D.C. for its annual legislative fly-in. Washington, DC (January 30, 2019) - National Sorghum Producers conferred two esteemed leadership awards during its annual D.C. Fly-in this week in Washington, DC. Secretary of Agriculture Sonny Perdue was recognized as the first ever Sorghum Champion administrative recipient and Senator Jerry Moran (R-KS) received NSP's 2019 Congressional Award. NSP recognized Secretary Perdue for his exemplary leadership and constant support of sorghum farmers through work with the White House and other agencies during the international trade case sorghum endured with China in 2018. Secretary Perdue is a strong advocate for rural America and was key to the support sorghum farmers received through the Market Facilitation Program. “Secretary Perdue is true champion for sorghum and U.S. agriculture,” says NSP Chairman Dan Atkisson, a sorghum producer from Stockton, KS. “We especially appreciate his continuous support and dedication to protect the sorghum industry as we weathered international trade challenges last year." 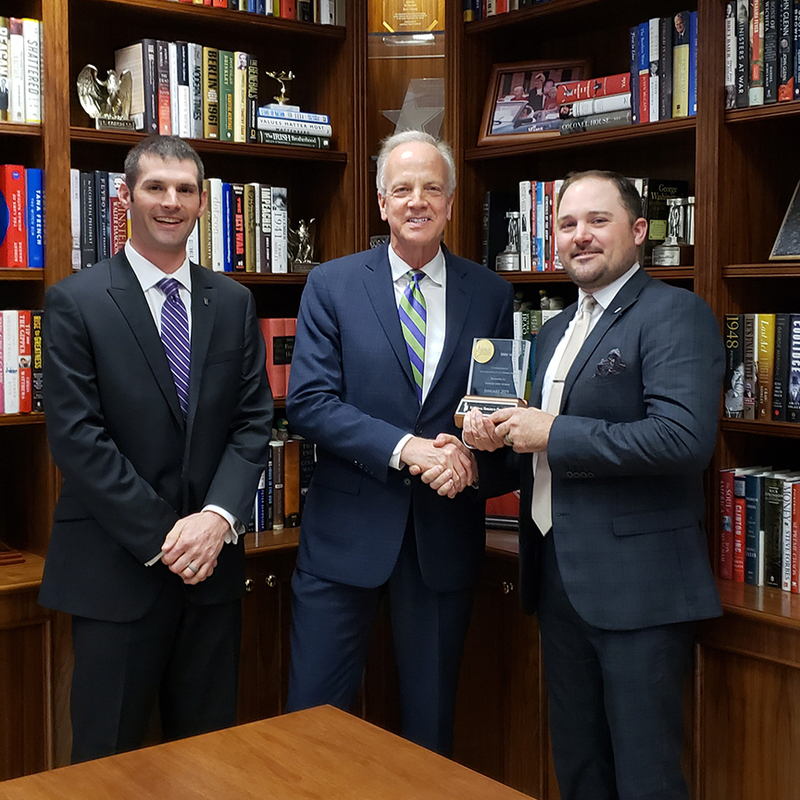 NSP's 2019 Congressional Award recognizes Senator Moran for his steadfast support of U.S. sorghum producers. Moran worked with the White House and the Administration during the course of the anti-dumping and countervailing duty cases with China, which was critical to political negotiations that led to the removal of the initial tariff on sorghum. Senator Moran has also been a strong leader through appropriations for sorghum research in Kansas and around the country through USDA-ARS. National Sorghum Producers Chairman Dan Atkisson of Stockton, KS, presents U.S. Secretary of Agriculture Sonny Perdue with the organization's first ever administrative award for being a champion for the sorghum industry. National Sorghum Producers board director Craig Meeker (left) from Wellington, KS, and board Chairman Dan Atkisson (right) from Stockton, KS, presented the 2019 Sorghum Congressional Award to Senator Jerry Moran during the annual NSP Fly-In to Washington, DC.